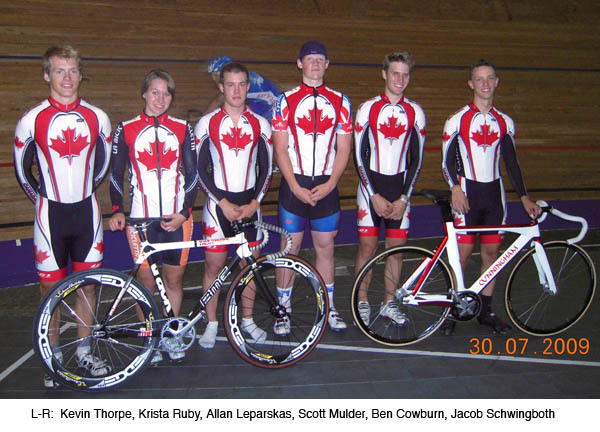 Today (Thursday) Team Canada’s assault on the Jr World Championships began at the Burnaby Velodrome. Six athletes have come from across the country to prepare for their biggest track competition to date. On hand was National Track coach Richard Wooles and project coach Jeremy Storie. Krista Ruby and Allan Leparskas have flown from Ontario to join Scott Mulder, Jacob Schwingboth, Ben Cowburn and Kevin Thorpe in final preparations for the trip to Moscow. British Columbia is going through a heat wave and while it is still hot under the dome in Burnaby it is cool in comparison to the scorching outside temperatures. On day one the riders went through some basic sprint efforts and steady state motorpacing for the endurance riders to loosen the legs up for the remainder of the six day camp. The riders at Burnaby will be joined in Moscow by Ryan Aitcheson and Florence LaPlante Lamarsh in Moscow who are both competing on the road as well. Stay tuned for more updates during the camp and race reports from Moscow.